In Scotland we have an ongoing transport problem. In some areas of the Highlands there is little or no public transport at all, since the demise of some Post Bus services, although the Post Bus carries about 50,000 passengers each year, according to The Post Office. A car is therefore a necessity in some areas. In Central Scotland there is a line of cars each morning on the M8 and M9, all moving in the opposite direction each evening, adding to their occupiers’ already long working day, and adding to the country’s carbon emissions. We also have the ongoing issue of The Forth Replacement Crossing which is to cost £2bn and the controversy surrounding the building and the funding of that. There have been alternatives suggested but it seems too late for the tunnel option now. In the Borders we are promised the new rail link from Newcraighall to Tweedbank but not until 2014, despite the fact that the Scottish Government passed the necessary legislation in 2006. Sustrans suggests that about 21% of car journeys in urban areas could be replaced by public transport, if only that transport system was more regular and affordable. Only today, Nicola Sturgeon has been introducing Andres Duany, an internationally acclaimed designer who is to help create a blueprint for the towns and cities of the future. She said:- “Scotland is leading the way on reducing our carbon footprint and introducing modern measures for modern times, to help meet our ambitious climate change targets. Creating sustainable communities will help us become less reliant on fuel consumption and boost our standard of living. Yes, working locally (or indeed working from home at least some of the time) is one way of reducing commuting and the carbon emissions which flow from that. But there are those who have to work from an office. Your receptionist would be little use to you working from home for example! Our bus industry is subsidised by The Scottish Government, and a renewal of that subsidy was announced last week. Transport Minister Stewart Stevenson said:- “The Scottish Government is committed to supporting our bus industry, and this agreement with CPT will deliver another three years of significant investment. This substantial outlay is intended to help the industry drive down fare costs, encourage more routes and enable more older and disabled people to use these important services. Older and disabled people will continue to be able to travel for free throughout Scotland – at any time, on any bus routes, for any number of journeys.” This free travel system for some of our population is a great incentive to them to use public transport. I know of one lady in Edinburgh who uses her bus pass regularly to go out for a wee run on the bus! She would not be able to do that if the travel was not free. Not perhaps the original idea behind the concessionary travel pass but nonetheless a good result! I am at the Embarcadero in San Francisco writing this post, watching hundreds of commuters plying backwards and forwards across the bay on ferries, then catching commuter buses up the few blocks to their offices. One commuter told me that with a travel card her crossing on the ferry costs under $5 each way. Considering that even a second class train ticket from Edinburgh to Glasgow is now £20 or thereabouts, our travel costs are extremely high. Of course some of this is down to cheap fuel which is still abundant here in the US. But even if one ignores the economic cost, there is still a lack of choice in our public transport, not only in the ways of getting from A to B but also in the timings and frequency. Of course if you live on the West Coast you have the alternative to take the seaplane from Glasgow to Oban which is very popular but still a little costly and weather dependent to use it every day! We should have an abundance of ways to travel which mean that it is plain silly to take a car. Yes, there are people who have to use cars for their work if they need to be in several places in one day for example. But there are office-based workers who ought to be persuaded out of their cars and onto public transport. It requires a choice which is more convenient, more pleasant than driving in a car park, and more available. So for example, if someone living in Fife was able to take a ferry to Edinburgh from somewhere that they could either reach by bus or park a car easily, and if there were buses (or perhaps trams?) waiting in Edinburgh to take them to the centre of town then that would appear to be convenient. But if the ferry stops at 7pm it will not attract any office workers at all who regularly have to stay late to get things finished off. So Stagecoach’s plans to introduce a hovercraft service across the Forth are absolutely on track but they will have to consider the timetable very carefully principally for reasons of safety but also for convenience. Business 7 already reported in November 2009 that a joint venture has been set up between Stagecoach and the Bland Group to operate the hovercraft between Kirkcaldy and Portobello. Stagecoach is also trialling an amphibious bus on the River Clyde to see if that would work as a seamless form of road and river transport. They already operate such a service in Rotterdam. So there are some initiatives out there which seek to address the shortcomings in our modes of transport, and offer more choice. Wifi would be a good way to attract passengers. If you could use your travel time to tidy up some emails or do some social networking then it would be a good use of your travelling time. So all buses and trains should now be equipped with a good wifi system. When travelling from Edinburgh to Glasgow consider the Citylink bus with its wifi. Some other services to Fife from Edinburgh also offer wifi. So that takes us back to the cost doesn’t it? And of course the best way for us to be made to get out of our cars is to make it an easy option with little cost differential, or at least an easy way to pay. The Oyster card in London is a most convenient way to use the public transport system there. One card for all modes of transport whether it is tube or bus. Such a simple idea. 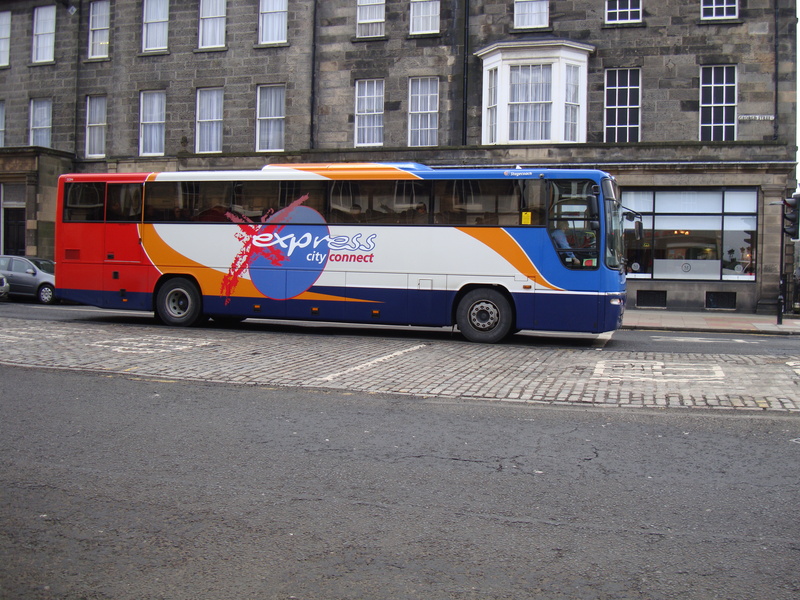 So even if our national government cannot completely address the problems and encourage less cars on the road and more people travelling on buses and trains then perhaps The City of Edinburgh Council could see the sense in having one travel card for residents and tourists alike, meaning that we would no longer see so many empty double decker buses running around our capital. Instead, we would have a commuter transport system that is easy to use. Our bus system in the city itself is actually fairly dependable and pretty regular. Our trams when they are in operation may prove even more reliable, but we will need to encourage people to use them. So a Saltire card (this is my suggestion for the name) might just be one way to persuade us onto public transport, but another important way is to make the public transport system a 24 hour affair. People’s working hours are more erratic than they were in the post-war days when office days started at 9 and finished at 5. There are other industries which demand shift workers. We have a large part of our economy which is based on tourism. These workers must be able to get to work using the most economic mode of transport they can access, and tourists must be able to get around the city after hours without difficulty and of course without fear. Simple solutions to a very complex problem I know, but simplicity may be the key – and one of the answers. Next What do you know?